What if you have forgotten Active Directory Administrator password and you are unable to get into the active directory server? Relax, The password recovery method we have mentioned in this article was tested on Windows Server 2003, 2008, 2008 R2, 2012, 2012 R2 and 2016. The below password recovery method should to be performed on the AD domain controller that hosts the primary domain controller (PDC) emulator operations master role if you have multiple domains in your environment. Before we can modify the password for the AD Administrator user account, we need to modify the password for the local Administrator account stored in the Security Accounts Manager (SAM) database on the domain controller computer. A few utilities are available that will perform this function, but we will be using the excellent Offline NT Password Editor tool by Petter Nordahl-Hagen. A bootdisk (CD and USB) with the tool is available at the website. I will be using the bootable CD ISO image (cd110511.iso) for my scenario. Start the computer with the bootdisk (CD or USB) as the first boot device. Upon boot, you should be presented with the Windows Reset Password / Registry Editor / Boot CD boot option menu. 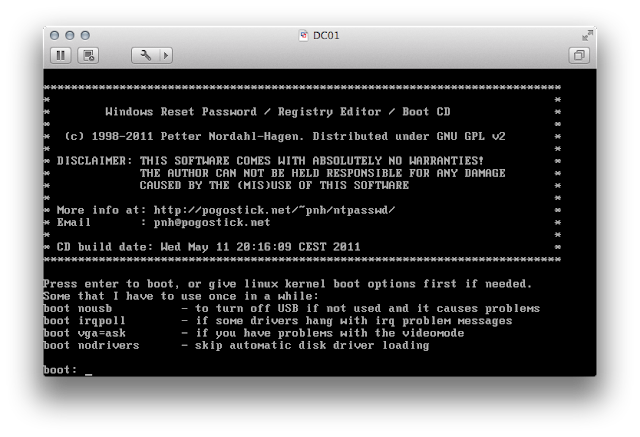 Press the enter key at the Linux boot: prompt. We will now need to choose the disk and partition where our Windows registry is located. My Windows Server 2012 configuration has a single disk with two partitions. Partition 1 is the hidden system reserved partition, so I will select partition 2 which is represented as the C: drive in Windows. The tool will now go thru its operations to verify it can successfully mount and access the NTFS file system. You can just press the enter key to accept the default Windows/System32/config path for step two. Press the enter key to select the default 1 - Password reset [sam system security] option. Press the enter key to select the default 1 - Edit user data and passwords option. Our Administrator user should be the default option selected, so just press the enter key. You may be tempted to select option 2 to edit the Administrator password, but this operation has never worked in my experience. This leaves us with option 1 to clear the local Administrator user account password. Our task of "blanking" the local Administrator user account password is now complete. Our change will not be set until we write (save) our configuration. Enter ! to quit. And enter q to take us to step four. Enter y to save our work, and then enter n to decline the option to perform another run. Finally, enter reboot or halt depending on whether you want to restart or shutdown the computer before we move on to the next major phase. Don't forget to eject the media before you restart or shutdown. We will now need to boot into Directory Services Repair Mode as this will allow us to log on to the computer with the local Administrator user account (which is now blank). If we booted in normal mode, it would require us to log on with a privileged domain user account. Starting in DSRM takes the domain controller offline, meaning it functions as a member server, not as a domain controller. We can start a domain controller in Directory Services Repair Mode manually by pressing the F8 key during the domain controller startup. 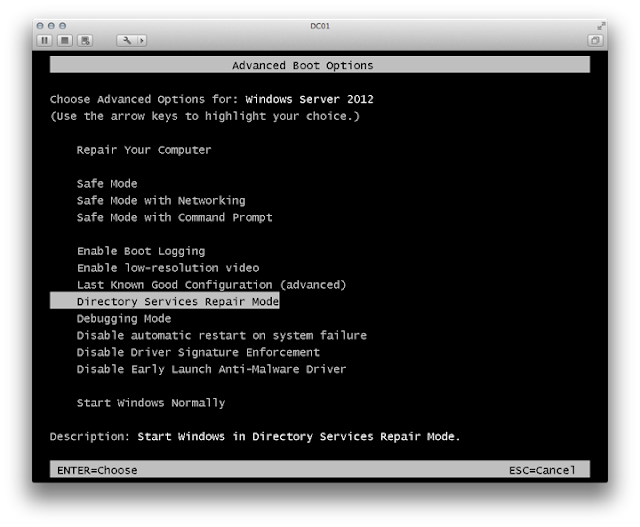 At the Advanced Boot Options menu, select the Directory Services Repair Mode option. At the Logon Screen, sign in as the administrator with no password. Note how I'm signing in to the local machine and not the domain because Active Directory Domain Services is in a stopped state. My computer's hostname is dc01 and the Active Directory NETBIOS name is example. After a successful log on, open a command prompt window. 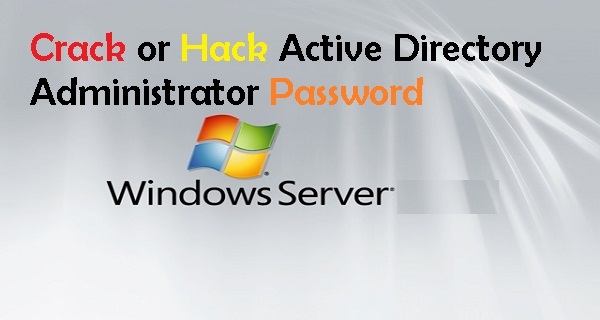 Our current task is now to change the default built-in Active Directory Administrator user account password. The preceding command essentially creates a Windows service named ResetPW that executes the net user command that changes the default built-in Active Directory Administrator user account password. The service is created with the behavior to autostart at boot and also run in the context of the LocalSystem user account. 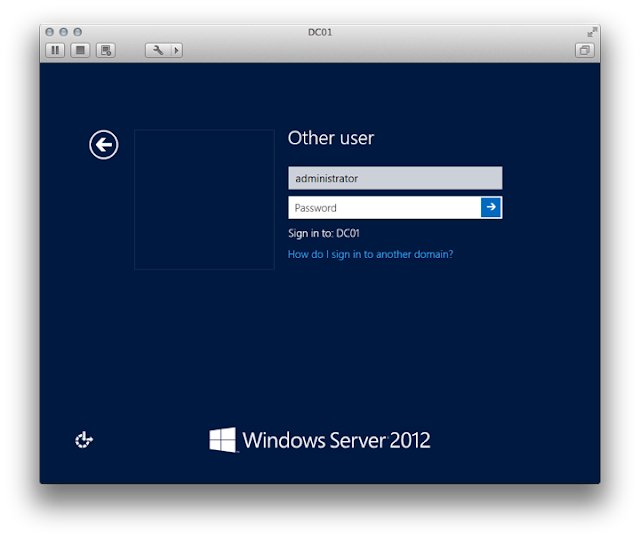 At the Logon Screen, sign in as the default built-in Active Directory Administrator user with the password we assigned with our custom service. My example used PA$$w0rd94 as the password. I had two primary objectives for this article. The first is to provide a solution for technical professionals to overcome "lost" or "missing" administrator-level user account password issues, and the second is to point out how trivial it is for someone to "pwn t3h" AD network when you lack physical security for your IT infrastructure.